The Regional Strategic Analysis and Knowledge Support System (ReSAKSS) supports the successful implementation of the Comprehensive Africa Agriculture Development Programme (CAADP) by providing policy-relevant data; facilitating dialogue among stakeholders; monitoring progress in reviewing goals; and strengthening mutual accountability processes at continental, regional, and national levels. ReSAKSS’ work is organized around four primary functions, outlined below. A core ReSAKSS activity is tracking CAADP’s Malabo Declaration Indicators though ReSAKSS website. ReSAKSS is currently in the process of upgrading its website with new features and tools to enhance functionality and accessibility. ReSAKSS’ Mapping Tool allows data on the status of CAADP’s indicators to be accessed, viewed, compared, and downloaded with ease and flexibility. ​Each year, the three-day ReSAKSS Annual Conference, organized by the International Food Policy Research Institute (IFPRI) in partnership with the African Union Commission (AUC) and NEPAD Planning Agency, provides the opportunity for high-level dialogue and information sharing, particularly focusing on issues of topical strategic importance. Since 2011, ReSAKSS Annual Trends and Outlook Reports (ATORs) have featured topics of strategic relevance to CAADP to help guide its planning, implementation, and dialogue processes. These topics also inform the agenda of ReSAKSS’ Annual Conference. ​In addition to its core publications, ReSAKSS collaborates with partners in the preparation of a variety of materials that share information of relevance to CAADP’s implementation, including lessons learned and progress made. ​One of the guiding principles of CAADP is mutual accountability. Country-level joint sector review (JSR) assessments are a key instrument for realizing this accountability and for implementing the CAADP Results Framework. JSR assessments advance mutual accountability through comprehensive, inclusive, and technically robust dialogue and reviews and progress toward achieving targets and goals. ​CAADP’s Results Framework is intended to ensure standard, tangible parameters for benchmarking progress in national agricultural performance. ReSAKSS tracks progress on CAADP indicators outlined in the Results Framework. While ReSAKSS operates at the regional level, country-level SAKSS are now being established to support the ongoing implementation of CAADP, particularly in terms of putting national agricultural investment plans (NAIPs) into operation. SAKSS platforms are structured networks of knowledge generators and users coordinated by a Secretariat hosted within existing relevant national bodies. In addition to establishing the necessary personnel and infrastructure, preparatory steps for each country include a capacity needs assessment, capacity strengthening strategy, concept note, terms of reference (for the SAKSS’ coordinator), and workplan for the SAKSS platform. ReSAKSS provides regular technical training to local researchers, statisticians, analysts, and other stakeholders on the CAADP agenda, SAKSS concepts, methods of assessing capacity needs, frameworks for monitoring and evaluation, as well as geographic information system and agricultural policy analysis and knowledge management tools. 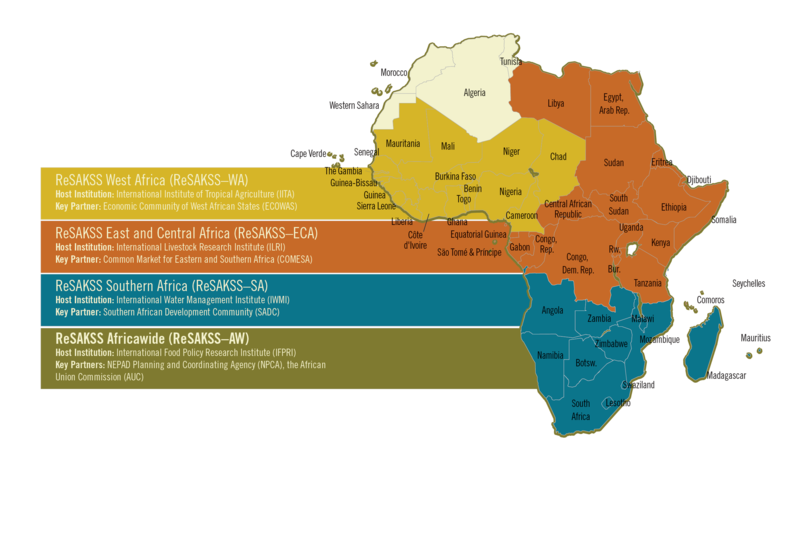 ReSAKSS is a multi-country network, structured around four “nodes”—one at the Africawide level, and three within each of Africa’s major regional economic communities (RECs): East and Central Africa (ECA), West Africa (WA), and Southern Africa (SA). In addition, each node comprises a network of national, regional, and international partners. The International Food Policy Research Institute (IFPRI) coordinates ReSAKSS Africawide under a governance structure chaired by the African Union Commission (AUC) and NEPAD Planning and Coordinating Agency (NPCA). Each regional node is governed by a steering committee chaired by its representative REC and comprising representatives of major CAADP stakeholder groups. The steering committees ensure that ReSAKSS’ activities remains rooted in Africa’s agricultural development priorities, the CAADP agenda, and regional strategies. ReSAKSS stakeholders and partners include government agencies, domestic and international policymakers and analysts, donors, research institutes, the academic and research communities, civil society, farmers’ groups, nongovernmental organizations, and the private sector. National partners comprise a wide array of government, higher education, and farmers’ organizations, including national ministries of agriculture, national agricultural research institutes, and agricultural and related universities. ReSAKSS was established in 2006 under the Comprehensive Africa Agriculture Development Programme (CAADP) for the purpose of supporting evidence- and outcome-based policy planning and implementation under the CAADP agenda. ReSAKSS was a direct response to the growing demand for credible information and analyses during the design and implementation of agricultural-led development strategies in support of CAADP. ReSAKSS Africa Wide is hosted at the International Food Policy Research Institution (IFPRI), in Washington, D.C. United States of America. ReSAKSS East and Central Africa is hosted at the International Livestock Research Institute (ILRI) in Nairobi, Kenya. ReSAKSS Southern Africa is hosted at the International Water Management Institute (IWMI) in Pretoria, South Africa. ReSAKSS West Africa is hosted at the International Institute of Tropical Agriculture (IITA) in Ibadan, Nigeria.